• refusal to license IPRs. The author also contrasts the Commission’s decisional practice with the case law, assesses approaches under U.S. antitrust law to similar forms of conduct, and incorporates insights from economic theory. This study greatly enhances our understanding of the distinction between abusive conduct and lawful competition. In the course of its clarification of the EU Courts’ responses to individual forms of market behaviour, an overall approach to the identification of exclusionary abuses under Article 102 TFEU begins to come into view. Apart from the important new synthesis the work offers legal scholars, there can be little doubt this book will prove a valuable asset and even an inspiration to competition lawyers. Acknowledgements. 1. Introduction. 2. Designing a Legal Framework to Distinguish Lawful from Unlawful Exclusionary Conduct: Challenges and Approaches. 3. 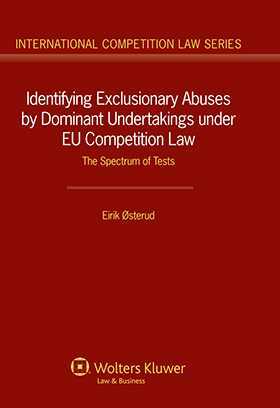 Identifying Exclusionary Abuses under Article 102 TFEU: Objectives, General Concepts and the Development of a Spectrum of Conduct-specific Tests. 4. Form-based Tests. 5. Intent-based Tests. 6. Effect-based Tests 1: Harm to Competition. 7. Effect-based Tests 2: Additional Harm to Consumers (Refusals to License IPRs). 8. The Concept of Objective Justification. 9. The Spectrum of Tests: Implications. 10. Final Remarks. References. Bibliography. Cases. Commission Decisions. Opinions. U.S. Cases. Regulations. Commission Notices and Guidelines. Green Papers. Speeches.